MK Guth: "Interaction and the Social Landscape"
Positioned around the rituals and sites of social interaction, my work calls special attention to the overlooked narratives in our everyday experiences. How we orient ourselves in the larger social and spatial landscape marks a continuation of this theme in my practice. Visitors are prompted to question where exactly the artwork exists, whether it is in the object, the performance, or somewhere more liminal in the context of the gallery space, which functions simultaneously as the site of presentation, performance, dining hall, or even a tavern. 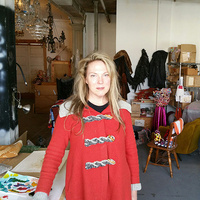 An alumna of the New York University graduate school of fine arts, MK Guth has exhibited her work internationally at numerous museums, galleries and festivals including The Whitney Museum of American Art, The Yerba Buena Center for the Arts, The Melbourne International Arts Festival, Nottdance Festival, England, The Contemporary Art Center, Cincinnati, Boise Art Museum, Gallery-Pfeister, Gudhjem Denmark, Franklin Parrasch Gallery NYC, Cristin Tierney, NYC, Elizabeth Leach Gallery, PDX, Swiss Institute, NYC, White Columns, NYC, The Frye Art Museum, and The Henry Art Gallery at the University of Washington. Guth is a founding member of the RED SHOE DELIVERY SERVICE, a collaborative performance project with artists Molly Dilworth and Cris Moss. She is the recipient of several awards including the Betty Bowen Special Recognition Award, administered by The Seattle Art Museum, and a Ford Family Foundation Fellowship.